Red or Two-Spotted Spider-Mites (Tetranychus urticae) feed by puncturing cells and draining the contents, producing a characteristic yellow speckling of the leaf surface. They also produce silk webbing which is clearly visible at high infestation levels. At very high infestation levels, reddish-brown masses of mites can be seen hanging from the tips of leaves. When populations of spider mite are this high, the pest can be transferred accidentally to clothing, and spread around the crop by workers. Spider mites are common pests on many vegetable and ornamental crops, including tomatoes, cucumbers, peppers, strawberries, roses, Gerbera and many other species. 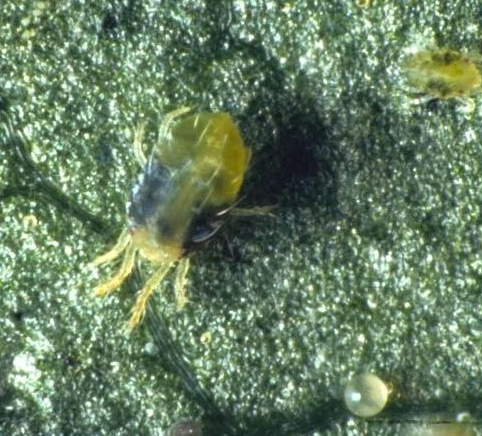 Mites enter an over-wintering state known as diapause in autumn, and seek hiding places in the glasshouse structure or on equipment. 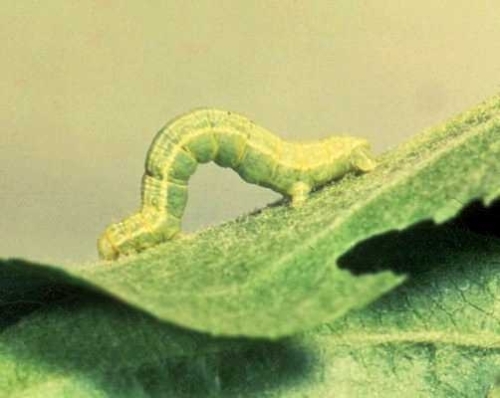 They will emerge from diapause in the spring and can re-infest the crop. Over-wintering forms are usually bright red, but red forms also occur later in the year. Certain strains produce more severe ‘hyper-toxic’ damage, leading to severe leaf damage and leaf loss at low population densities. The exact cause of this damage is unknown, but these ‘hyper-toxic’ mites are usually considered to belong to the species Tetranychus cinnabarinus, or Carmine Mite, and are generally red in colour. Recent research also shows that these more damaging mites are able to lay more eggs than standard forms. Green forms of T. cinnabarinus are now known to occur, but do not appear to cause the same type of damage. Distinguishing between the species is not easy, and some taxonomists still consider T. cinnabarinus to be a form of T. urticae. Other species of Tetranychus, such as T. evansi, T. turkestani and T. pacificus also cause crop damage in some countries. Related mites such as the Fruit Tree Red Spider Mite, Panonychus ulmi, and Citrus Mite, Panonychus citri, are also important pests.